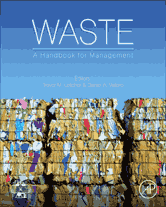 Waste: A Handbook for Management gives the broadest, most complete coverage of waste in our society. The book examines a wide range of waste streams, including: Household waste (compostable material, paper, glass, textiles, household chemicals, plastic, water, and e-waste), Industrial waste (metals, building materials, tires, medical, batteries, hazardous mining, and nuclear), Societal waste (ocean, military, and space), The future of landfills and incinerators. Covering all the issues related to waste in one volume helps lead to comparisons, synergistic solutions, and a more informed society. In addition, the book offers the best ways of managing waste problems through recycling, incineration, landfill and other processes. Co-author Daniel Vallero interviewed on NBC's Today show for a segment on recycling. Scientific and non-biased overviews will assist scientists, technicians, engineers, and government leaders. Covers all main types of waste, including household, industrial, and societal. Strong focus on management and recycling provides solutions.